Liam Hassin visited Dromore Parish Church in Desertmartin. A Larne student has paid his own poignant tribute to a relative who served in World War One. In a week when the centenary of the Armistice that brought the bloody conflict that was the Great War (1914-18) to an end was commemorated, Larne High School pupil Liam Hassin visited Dromore Parish Church in Desertmartin to lay a wreath in memory of his great great grandfather. Following the outbreak of the war in 1914, Desertmartin man George McLean cycled from his home to Omagh along with some friends to enlist in the 10th Battalion Royal Inniskilling Fusiliers. As part of the 36th Ulster Division, he saw active service at the Somme, Messines Ridge, Passchendaele, Cambrai and other battlefields. 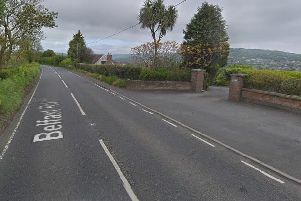 He returned home to Desertmartin and worked for Magherafelt District Council. George died in 1954.